Its always been traditional to have you and your bridesmaids carry an arrangement of blooms down the aisle. But even if you want to stick with flowers, your girls don’t have to! There are plenty of fun and unique alternatives to the classic floral bouquet that can reflect your personality and wedding style. Yes, this is reality – you can have a bouquet made out of candy. They’re colorful and textured and may even look like blooms from afar. This way, your girls will never complain about being hungry. Gather some vintage buttons of a similar color palette and put them altogether, like this bride did, for a unique and retro creation. Who needs a bouquet when you can have the trendy alternative of using paper flowers? They look just as beautiful and definitely won’t wilt throughout your big day. These bridesmaids opted for yellow dresses with a giant, white paper bloom to match the bride’s ensemble. I’m loving the bright colors and the size of the flower. You could also opt for an entire arrangement of multi-colored paper blooms. If you’re tying the knot outside, your bridesmaids can’t cool themselves off with their bouquet of flowers. But, if you give them a fan, they can stay cool and fashionable at the same time. For winter weddings, holding a bouquet of flowers during pictures may get a bit chilly. Keep your girls nice and warm with fashionable faux fur muffs that coordinate with the shade of their dresses. 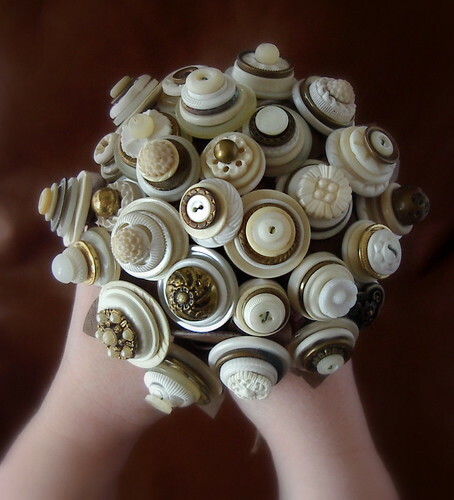 If you’re having nautical-themed nuptials or are choosing to exchange vows on the beach, create an arrangement filled with seashells of various shapes, sizes and colors for all of your bridesmaids to show off. Girls rarely go anywhere without some sort of purse, so have your bridesmaids carry their own fashionable clutch down the aisle. As long as they’re all in the same shade, they can be of various styles and shapes to fit each girl’s personality. This way, they can hold essentials of their own and have any backups that you may need, like makeup for quick touch-ups. What will your bridesmaids be holding on the day of your wedding? Share your thoughts with us!